We are thrilled to be here with you today. I am coming out of maternity leave to talk about how to use food to balance your hormones with my dear friend here, Magdalena Shalaki. She has come out from Colorado to talk about her amazing new book, “Cooking for Hormone Balance” and it's brand new! 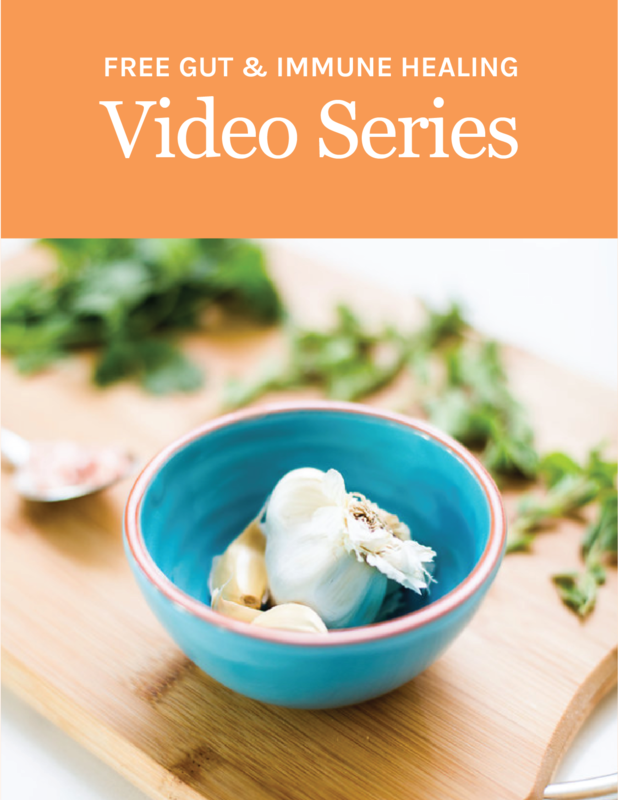 Get the first chapter, 5 recipes and 6 videos free here. Watch the Facebook Live video, or you can read the full transcript below. Christa: Give us a little background, because you were a hormone expert for over 10 years and you know, we go through a lot of challenges as healers, we heal them and then we teach people how to do it, so I think that was your path, right? Hashimoto's? Like, let's hear a little bit about your background. Magdalena: Yeah, Hashimoto's, estrogen dominance, adrenal deficiency, issues with gut issues for a very, very long time. Magdalena: Parasites, SIBO, H. Pylori, a lot of infections combined with very stressful life living between airports and hotel rooms. You know being in a regional job, very stressed out with working on Fortune 100 brands and a realization in my late 20s that food has got something to do with how I looked and you know it was my face cystic acne. I was covered in cystic acne. That was my thing. Christa: That's so hard. I mean you don't even want to face the world. I know the clients I've had with that it's so debilitating. Magdalena: You can't cover it up. It's like little volcanoes you've got in your face. Right? For those of you who … You know what I'm talking about. I had on my chest, on my back, you just couldn't cover it. I found this article that said, “Why is it that children in Papua New Guinea, or teenagers in Papua New Guinea,” right? Deep, deep inside the country, just next to Indonesia, have no zits? And I thought, “huh, they have no zits? How can that be?” Right? They think it's just part of a course of being a teenager. Magdalena: Right. The same way it's a course of having terrible PMS's, or going to menopause and just going through hell at that time, and what I realized is that when I gave up gluten and eggs at that point, I've realized that … it's made such a profound difference. Not just me skin cleared out, but my migraines went away, the PMS become much more bearable, right? It was such, and of course, my skin cleared out, which is the biggest winner. When you're in you're 20s, you need to look gorgeous. Christa: Oh, that's so cute. Well, anytime. All women want to feel beautiful, there's nothing wrong with that. Present yourself to the world, and glowing skin is a sign of health. Anything on the outside is a byproduct of what's going on inside. Magdalena: Absolutely. And I have told my clients for years, or everyone, all of you guys watching, PMS, you have to have clients come in and they say, oh my PMS week is awful, and then on fine they say, that's 25% of your life, that's not okay. So we need to talk about hormones today and how you can float through that period of time with grace and ease, menopause with grace and ease. Where do we start when we're talking about using food as medicine to balance our hormones? Magdalena: If somebody wants an answer of going like, “What are the three foods that I can add right now to re-balance my hormones?” There are a couple of it you can see, this food that's laid out here, so we can talk about a couple of these food. Christa: Yeah, we'll show you 'cause I know you probably can't see everything down here. Magdalena: But there's really about setting the foundation for good hormones, and the foundation is using analogy of a three-legged stool, if you want to sit comfortably in a three-legged stool, right? All the legs need to be firmly in place. If one of them is short, you start wobbling. One of them is missing, you gonna fall. And in the context of hormones, it's the health of your digestion, right? Which you talk a lot about. The sugar balance, and is the health of our liver, which interestingly takes care of metabolizing and getting rid of a lot of our estrogens and hormones and thyroid as well. This is really the foundation, and that's what the book is all about, is to setting the foundation right. After that, we can be adding a lot of nice things like, for example, maca can be a lifesaver for a lot of women. And sometimes it works for a while, then it stops working, and the reason is that the foundation is not set properly, the maca works a little, works for a while, then it stops working is because the foundation you get could be messed up, it could be having candida issues, which you are a fan of talking about that. Your liver could be completely out of sync, right? Christa: You can't plant flowers in a junkyard is what I say. You can't plant flowers in a junkyard. You have to do the cleanup work necessary to till the soil, so you can grow plants and flowers, right? Christa: And that's what we're doing, the liver's so important, blood sugar balance is 90% of adrenal health. Christa: I love it. And I love that your book goes into all these clinical components. You guys know that, yes, we talk about using food as medicine, but we are both practitioners that are functional nutritionists, and we want you to heal from the root cause. We want you to really understand this, and you go into it in your book. How to achieve better digestive health. How to test yourself for if you have candida. How to start to really heal the liver, and then, use these foods as medicine as a regular basis to create and keep hormonal balance. Christa: Okay. It's one thing that I know, we have a lot of positive feedback from all of you when we say we're going to talk about 20 super foods that create hormonal balance. I love, whenever we do a live with our tribe, I like for you guys to all take notes, and everybody have action items, right? At the end of this, I want at least five things, five new foods, five things you're going to do differently to start creating hormonal balance as soon as we're finished, right? We are all so busy, if we're going to spend our time watching something, it better be positive effects in our life. Let's talk about some of the foods that we have on the table. I think we should start off talking about maca, 'cause you just mentioned it, I talked about maca a lot in my fertility book, and I know that we're on the same page with maca. Magdalena: Oh, I see, okay. Christa: Magdalena, why do we need gelatinized maca? Magdalena: Here's an interesting thing about maca, every time we post something on Facebook about maca, on Instagram, we get half of the comments coming in saying, “I could not live without it,” and the other half says, “I have such horrible reaction to it.” The reason why a lot of people are having a reaction to is that you do not want to be doing raw maca, that's the first rule. When you travel to Peru, they actually boil it down, mash it, dehydrate it, and that's done on purpose. You're not supposed to be eating raw maca as much as this raw food movement everywhere. Christa: I don't even know why they create it. Magdalena: I think it's part of the whole raw food movement. Fantastic for PMS's, perimenopausal, so hot flashes, night sweats, it can help a bunch. Christa: We both like the same pheno-type, the yellow maca for fertility. Magdalena: Yup. Which is also known as maca peruviano, the step down below that would be the meyenii, which is in this case that's the type that you can also get. The other thing about maca to consider is, the amount your starting off with, so always start off with one teaspoon, and then build it up to tablespoon. You do not want to be doing more than 1 tablespoon. A lot of times we think more is better. Magdalena: It's not, doesn't have to be. Christa: You can overdo it with food and super foods, absolutely. Christa: It makes the difference. Magdalena: And you know, if it doesn't agree with you, just back off and there's so many other tools that you can incorporate. Christa: That can be one action item, guys, that you can start to add that to your smoothies, maybe. Maybe. Would you add it any other place besides a smoothie? Magdalena: I would add it to deserts. We're going to be talking about the Maltese that I prepared. Christa: Is this a recipe from your book, the Maltese? Magdalena: It is a recipe from a cookbook. You can put maca into this, and be very creative with what to add to Maltese. Christa: Tell me what's in the Maltese, what's the green? Magdalena: The green, it uses matcha. The base is using coconut butter, coconut oil, I'm wondering, do you guys know coconut butter is anyone using coconut butter here? Christa: Oh yeah. Oh yeah. Magdalena: You trained them well. Christa: Absolutely. They're using coconut butter and coconut oil, we love the medium-chain fatty acids. But, tell us the difference why coconut butter, what the different point between coconut oil and coconut butter, health-wise. Magdalena: It's got a lot more, it's got fiber, it's got the meat in it, right? So the meat and fiber and proteins are not taken out, so oil is just the oil. Here, you also have all the fiber, the protein and what's also cool is that … then we're using lime juice and lime zest, which is … do you want to have a piece? Christa: Yeah. I have to try it. You'll never miss cheese when you have coconut butter or even cashews. Christa: Chocolate cheesecake. And then, would you ever make them with pomegranates? I see you have them on the table for hormonal balance. I love them for heart health too. Magdalena: Absolutely, right? But also, interestingly, for women going through perimenopause, beginning to have hot flashes, and night sweats, this can also help, right? It's beautiful … it contains on the biochemistry behind it, right? Selective estrogen receptor modulator, which means that it helps to promote, to bring in the good estrogens and blocks the bad estrogens from coming through. Super important. Christa: I think that it's … could you just talk about that for one more minute, I interviewed, I don't know if you know Mache Seibel? Christa: And he talks a lot about … he's helping us to stop demonizing estrogen. The most important mid-life medical decision a woman ever makes, is what to do with estrogen and it's not all bad. So just educate our tribe quickly about between good and bad estrogen. Magdalena: Estrogen receptor positive breast cancers are just majority of breast cancers in the United States. 80% of them, right? Lumps, fibrocystic breast, you know? When you just got this pain, and I don't need tell you, the pain, the fear that when you find the lump on your breast, right? It's one of the most awful times of your life, right? Every woman remembers that, what do I do? All of that can be due to estrogen dominance. What happens is that, we need estrogen. So Mache was absolutely right, let's not demonize it. The problem is, there's two issues. One is how we break down these estrogens into metabolites, happens in the gut and in the liver. That balance has to be somewhere in the middle. Unfortunately, we have a lot of digestive issues, poor health of our liver, introduce a lot of chemicals from skin care products, right? The balance goes towards those antagonistic, those carcinogenic, if you will, estrogens. The other possibility is that you have too little estrogen, oh sorry, too little progesterone, as compared to opposed progesterone. And progesterone is something that you cannot find in food, what we can do is, we can bring in certain foods to support the production of progesterone in the body. But we need to have a balance of those two. Christa: Yes. Yes. Okay. Now, tell me how to use pomegranates and how do they with estro imbalance, and then a couple of foods, I'm thinking that help progesterone balance, like bananas, you basically want to use foods high in vitamin B6 that are pre-cursors to making progesterone. Magdalena: Pomegranates first. You know, they contain something called the selective estrogen receptor modulator. Like I said earlier, those bad estrogens are basically blocked from coming through. It's only when the bed estrogen gets into the cell. For example, when you have fiery nodules or breast lumps, right? It's those bad estrogens, those metabolized that cause the growth of malignant tissue. Something like a pomegranate is a natural way of blocking that, that's why it's called selective estrogen receptor modulator, because it selects which estrogen gets through, and which one doesn't. This is, it's like a chemistry. Christa: It's so powerful. Food is one of the most powerful forces we have. Magdalena: Start bringing those in. If there's fresh pomegranates around your area, start bringing them into salads, you can put them even, into smoothie. I'm not big fan of juicing them, because you're losing all the fiber, but also, the estrogen receptor quality that I mentioned, it's in the seeds itself. You want to use that as a whole. Christa: Yes. Okay. I've never actually seen that. I know Navitas made pomegranate powder. Magdalena: So, that's made, not just with the fruit, but also with the seeds. Beautiful tart, the tart is sweet-ish flavor, wonderful to add it to your smoothies any desserts that you're making. Christa: I'm seeing a really powerful smoothie building here. I don't know about you guys. Christa: Okay. That's great. And this is probably high in vitamin C, and then all the benefits for heart health, supporting the chambers of the heart, it truly is a super food for the whole body. I think you guys, you're starting to see, even if you've been part of The While Journey for any length of time, you know, how many times have I said, “all disease begins in the gut.” And I include the liver as part of the digestive system, and so it is just so crucially important. Magdalena: Put it this way, have you ever met a person who's got digestive issues, liver issues, or digestive issues, and is a healthy person? ‘Cause I haven't. Christa: It's impossible, yeah. It's impossible. Okay, good. And we've got some cruciferous vegetables here. You want to talk about these guys? Magdalena: Absolutely. You know the book is based on the 20 super foods and 20 power herbs, spices and medicinal mushrooms. Christa: Oh I love … yes. Christa: And broccoli sprouts, which we have here too. Magdalena: We have here. Let's talk about these in just a second. A couple of things. One is, they contain a substance called DIM, Diindolylmethane. And many of you may be taken them in the form of a supplement, but there's also wonderful, I think, to bring, in that actually form, right? And what I love about DIM is that, it's a natural estrogen detoxifier. The estrogen we talked about, DIM helps tremendously with that. Magdalena: You are doing yourself a huge disservice by taking them out. Don't do that. Christa: You have to eat so many to have that gastrogenic negative effect on the thyroid, so keep them in, keep them cooked. Magdalena: In fact, estrogen dominance binds up the thyroid binding globulin, right? You actually end up having least thyroid hormone available in for your body for yourself to utilize when you have estrogen dominance. I have never met, my whole practice started off with thyroid. I have never met a woman who's taken out all cruciferous vegetables and heal her thyroid. Magdalena: Never. And those things are the ones that will tell you the same thing, Doctor Allan Christensen, Doctor Karazi, and everybody's on the same page, it's just that silly blogger, copy paste thing that just had made such a disservice. Christa: Yeah. It's kind of just to get website hits, right? Magdalena: That, ignorance and copy-paste. Yeah. Magdalena: Can I just tell you about broccoli sprouts? Christa: Of course, I love broccoli sprouts. Magdalena: So broccoli sprouts are an absolute super food. Does your audience a lot of people here have perimenopausal, menopausal stuff going on? Breast lumps, breast cancers? Christa: Perimenopausal, everyone, one in eight women get breast cancer, so it's a concern for everyone. So go ahead, let's talk about some good glutathione producing food here. Magdalena: Yeah. Glglutathione is one, the thing that I want to focus on with broccoli sprouts, hey you guys, before the broccoli becomes this big, right, it starts off with this. And you can grow this at home yourself, you can also buy in the health store, you want to specifically do broccoli sprouts, not clover, not alfalfa, specifically this, and it contains a substance called sulfurathane. Sulforaphane is a very potent estrogen blocker, you know how we talked about how the bad estrogens multiplying, right? The malignant cell? Sulforaphane, there are studies that show that not only does it prevent breast cancers, so if you're one of those women who is genetic, fair enough. If you have my BRCA 1, or BRCA 2 or her 2 genetic, mutations, then I'm not talking about that. I'm talking about your mom had it, and you have it, right? And there's no genetic element involved, right? And you've been told that it's so common, everybody gets it. Get this out of your head. It's completely like if it's an estrogen receptor-positive breast cancer or lumps, it's completely reversible and preventable, and you should be doing something about it. This is one of your solutions. Not only does it prevent breast cancers and breast lumps, but studies after studies showing that it shrinks women's breast cancers. Christa: It gives me chills. Christa: My mom had breast cancer, and she trashed her tamoxifen. Christa: And just in general, if you're trying to heal, it's going to … so florophens can help heal, that's going to help produce mitochondria, it's going to help the liver, it's going to help all kinds of things, and so that's another way to just extinguish free radicals, and to start to produce highest levels of cellular health and energy. Christa: So I chop them up really fine, and then stuff them in a sandwich, or wrap them up in a cassava burrito just to get them in. Christa: There are a lot of ways … and your book has got a ton of recipes. If you want to know how I'm going to start to work all of these in, you get the book. Cooking for hormone balance. We have to cook anyway, we have to eat anyway, every time we eat, it's an opportunity. Every time we lift that fork to heal or to hurt, not just you, but your family that you're feeding, and there's so many beautiful options. We've got some beautiful seeds here. I love talking about seeds and food as medicine, so let's hear what you have to say about how do you seed rotation to balance your cycle and hormones. Magdalena: Yeah. Let's pair up those two first. So. Let's me just talk about the concept. If you take a full cycle, let's just say 28 days, right, you start menstruating. If you're going through perimenopause, crazy time where there's no normal, I'll talk about that in a second, but it's applicable to both. Even for women with menopause, this totally works. If you take a full cycle, if you're still menstruating, let's say 28 days, you want to divide it to two sections right? The first part will be your phelacular phase, that's from day one of your cycle, which is day one of your period, to day 14, which is around your ovulation, and then you're switching over to an eluthial phase, right? Day 15 to 28, you switch over to different kids of seeds to help you promote progesterone. The first cycle is all about building up estrogen, the second cycle is all about building up your progesterone levels. Christa: I love this so much. Magdalena: Right? The first part is, and you may have heard of this, that flaxseed is estrogenic. So this is to your point, like a lot of myths get, like you talking to Mash about estrogen is good, well, guess what? This is a beautiful source of estrogen. This is the kind of estrogen you do want. There's no need for being afraid. What we want to do is combine flax seed together with pumpkin seeds, and that's going to help us tremendously with estrogen production, right? Christa: You want to open up the flax seed and grind it? Magdalena: Yes. One tablespoon, one tablespoon, freshly ground. Christa: Okay. Coffee grinder. Don't drink coffee anymore, ditch the coffee and grind your seeds in there. Magdalena: Oh, you are so my sister. As you can see, we are showing that in the full form, right? Because that's how we store it here. If I pre-grind, I do get lazy, so I do pre-grind mine, but for no more than three, four days, and I put it in the fridge in an airtight container, 'cause you won't want flax seed to get oxidized, 'cause that just loses it's potency. So that's that. Christa: We literally just pulled these out of my fridge. Yes. Hemp is on top, so ignore those for the purposes of this broadcast. Magdalena: Yes, ignore the hemp, just focus on the sesame seeds at the bottom, together with sunflower seeds. You know why? Christa: Plus you're getting vitamin E, this is awesome. Okay, go ahead. Magdalena: You get vitamin E, the critical compounds here that will help us with the production of progesterone. And actual production. Christa: And you also get the calcium from the sesame seeds. Magdalena: And you get the fiber to help you poop. Christa: And you get the fiber to help you poop, and you know what? The better your poops, the more you're pulling excess estrogen out of the body, and big parasite killer here, pumpkin seeds. Magdalena: Ah, did not know that. Christa: Where you can't separate, not a set of one food is just good for the hormones, and that's just good for the digestion, it's all whole body health. Let us know what your 5 things are in the comments. I would like to see you getting coconut butter in your diet, and a lot of these we can make one huge smoothie, right? Magdalena: Rather than the source of fear and confusion, right? Christa: Yes. It's a source. It's the greatest power any of us have for our health and our emotional well-being. Christa: Jenny do you see any questions coming in that Magdalena can answer? Jenny: A couple of people were asking about hormone testing and how do you know if your hormones are really out of balance even if you feel it, how do you really know for sure? Magdalena: That's a really good question. There are specific tests, if you're testing your thyroid, you can do it through blood, that's not an issue, right? However, when it comes to seritoid hormones like your cortisol, progesterone, estrogen, DHEA, testosterone, blood is completely useless. It's going to show you everything is normal even though it's not, so doing it through saliva or, really, urine, that's the latest way to to this, is way better. Christa: I mean, I think everyone that's listening and watching, we get so frustrated with mainstream medicine, where we spend all these time, money and energy running these labs that are effectively useless, to be told we're fine when we're clearly not. Magdalena: Who really understands hormones. I just want to emphasize that, 'cause a lot of people don't. Christa: A functional endocrinologist is like the bees-knees right? That's what you want to find, because otherwise, yeah, you're going to get told that you are just fine by a standard doctor's “normal” range. Magdalena: And as you said, I really like what you said just now about ranges, right? For example, progesterone could be from 50 to 220, that's a huge range. Christa: Magdalena, you're awesome, and you're really, you're a wealth of knowledge, I feel like we can have hours, so I guess we just get the book, huh? That's what we have to do, get the book, read the book, there's a ton of clinical knowledge in the book, it's not just a cookbook, and it's going to re-wire your whole thought process behind cooking.